Rated PG-13 for language and some crude comments. The odds seem stacked in "Logan Lucky"'s favor the instant you spot "Directed by Steven Soderbergh" in the opening credits. Sure enough, it's a winner. Soderbergh is one of the reigning masters of the heist picture: he did the "Ocean's Eleven" remake and its two sequels, plus "Out of Sight" and "The Underneath." This one's about a bunch of good ol’ boys trying to rob the Charlotte Motor Speedway in North Carolina, but the vibe is so similar to Soderbergh's hit heist trilogy that a TV newscaster fesses up by describing the gang in this one as "Ocean's 7-Eleven." The movie is put together with the no-fuss confidence of Soderbergh's best entertainments, staging comedic banter and suspense sequences with equal assurance, even playing sly perception games with the audience by making you wonder how smart or dumb the characters (and the movie) actually are. The story centers on two brothers, both wounded war veterans. Jimmy Logan (Channing Tatum), a onetime coal miner, lost a leg in the service. Jimmy’s younger brother Clyde (Adam Driver) lost part of an arm, and now tends bar at a roadside saloon where Jimmy is a regular. An obnoxious customer jokes that if you put the Logan boys together, you’d get a whole person. That's not too far off the mark: like redneck cousins of George Clooney and Brad Pitt's characters in the "Ocean's" movies, they amplify each other's better qualities, and maintain a united front even when they disagree. Legend has it that the Logan family, which also includes a badass, hot-car-driving kid sister named Mellie (Riley Keough), is cursed. Throughout "Logan Lucky," you keep wondering if the curse will rear its head and ruin the plan Jimmy has cooked up with Clyde and a third partner, an imprisoned explosives expert named Joe Bang (Daniel Craig) who's five months away from release. It’s a heck of a scheme. Seems the Charlotte Motor Speedway has a sinkhole problem, and Jimmy was part of the team of ex-coal miners brought in to fix it. While toiling beneath the stadium, he learned that concession stand earnings are delivered to a cash vault deep in the basement by way of pneumatic tubes. The Logans promise that with a little help from Joe they can break into the vault, steal the cash, and walk away rich. Joe says he’d be happy to join the team if he weren’t, as he sneers, "In...CAR...cer...a...TED." No biggie. The Logan boys offer to bust Joe out of prison long enough to join the heist, then sneak him back in. At this point you may start to wonder how smart the Logans actually are and how seriously we're supposed to take their boasting. There are two kinds of people who make promises like the ones the Logans make to Joe Bang: hotshots and idiots. The characters in this film are drawn with broad enough strokes that they could go either way. The Logans and the Bangs—including Joe's younger brothers, Sam and Fish (Brian Gleeson and Jack Quaid), one of whom claims to be a computer expert who knows "all the Twitters"—are a loquacious bunch of misfits and scalawags, nervy as hell. But sometimes they sound like characters from one of those Coen brothers movies filled with dimwitted braggarts—think "Raising Arizona" or "O Brother, Where Art Thou? "—and each one has a different accent. Driver sounds like Forrest Gump eating peanut butter, Craig has the barbecued hambone drawl of a sheriff from a 1970s hicksploitation picture, and there are times when Tatum seems to forget to have one. Only Keough, the granddaughter of Elvis Presley, seems as rooted in life as the screenplay's references to NASCAR fandom, the child beauty pageant circuit, contaminated groundwater, and the fall of the mining industry. You may also wonder if this is the kind of film that believes in curses. Some films do, some don't, and others leave you guessing. There are no curses in "The Sting" or "Ocean’s Eleven," but characters in Coen brothers films often do seem cursed, not just by their own overconfidence or stupidity, but by coincidence, misunderstanding or fate. Things go well enough early on in "Logan Lucky" that you start wondering about the movie's point of view on destiny, bad mojo, and the like. Is the movie's title sincere, ironic, or neither? All questions are answered in due time. The screenplay is credited to Rebecca Blunt, supposedly a young first-timer getting her big break, but it’s an open secret that it was really written by Soderbergh’s wife Jules Asner, who hails from West Virginia. She partly based Jimmy, a faded high school football star, on Channing Tatum, who grew up poor in Alabama, Mississippi and Florida, and was headed for a college football scholarship until he wrecked his knee and turned to stripping and modeling instead (see the Tatum/Soderbergh "Magic Mike" collaborations). Soderbergh directs the script (and edited and shot it under pseudonyms—a Soderbergh family tradition, it seems) with his characteristic smoothness, moving through the story so deftly that you don't realize you've already gone from point A to point B until you're already en route to point C. There’s no wasted motion. Everything happens as it does for a reason. There are points where you might assume that the film is rushing through incidents that it can’t adequately explain or justify, or just flat-out forgetting to give details that would make a character’s actions make sense. But that proves not to be the case. The film gives out information on a need-to-know basis: if you don’t need it, you won’t know it. This need-to-know aesthetic carries all the way down to the level of individual shots. Soderbergh's camera is constantly framing scenes and moving through space in order to conceal or reveal information about the characters' motives and the progress of the heist. Some shots are structured like well-wrought jokes—one where you think you know where the story is headed, then laugh out loud when it takes you someplace else. A lot of times you have no idea what you're looking at or why it's important until Soderbergh moves a bit to the left or shifts focus to make you go, "Aha!" There are few working directors who still know how to make a film this way. Soderbergh is one of them. 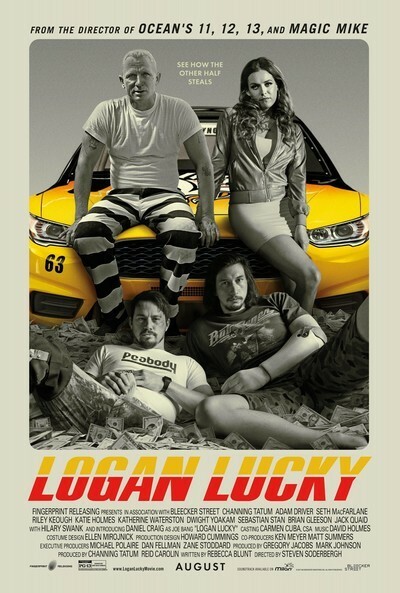 "Logan Lucky" is not a deep or particularly original film and isn't trying to be, and there are moments when you might wish that it had taken an extra scene or beat to flesh out its oddball characters and give them more than two dimensions (though there are moments—the one set at a school recital, in particular—that do exactly that). And a couple of characters who are introduced with great fanfare (notably a clinic worker played by Katherine Waterston, and an FBI agent played by Hilary Swank who snarls like Clint Eastwood) don't make as much of an impression as they should. But it's precision-tooled entertainment made by experts, and sometimes more than that. Watching it is like finding money in the pocket of a coat that you haven’t worn in years.